On May 18, 2004, Phuc Ha Investment and Development Joint Stock Company celebrated the inauguration of PPR, uPVC and PEHD plastic pipe and fittings factory at Km 23 + 700, National Road 5, belonging to commune History, My Hao District, Hung Yen Province. This second factory of Phuc Ha Company with synchronous modern production line of the Republic of Austria, Germany, is one of the most modern factories in Southeast Asia today. Putting into operation of this plant, Phuc Ha Company has increased its production capacity of plastic pipe and accessories 3 times more than before. The plant was started in March, 1515 and was put into operation in March 2016. The factory building area of ​​the new factory is 20.000m2 on the total area of ​​40.000m2. - Phase 2 when the plant is full of machinery and equipment, the total investment capital is estimated at 40 million USD, designed capacity will be 132,000 tons per year. - PPR pipes and fittings are diameters from D20mm to D200mm and have production capacity up to D500. - HDPE pipes and fittings have diameters from D20mm to D1200mm. - uPVC pipes and fittings are diameters from D21mm to D500mm (including smooth and hot gaskets). Founded in 1993, Phuc Ha Investment and Development Joint Stock Company (formerly Phuc Ha Co., Ltd) is one of the leading companies in supplying water and construction products. Established, prestigious in the market. The products of the company are manufactured on modern lines of Germany, Austria - According to international standards (ISO, DIN, BS, TCVN) with high quality, durable, beautiful design to meet the needs. bridge of civil and industrial works. Up to now, Phuc Ha Investment and Development Joint Stock Company has been involved in manufacturing plastic pipes and fittings for the water industry for more than 10 years. 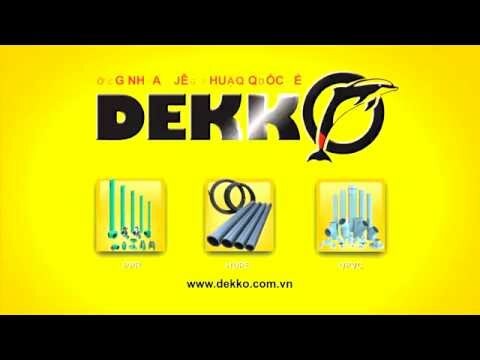 Products of the company with the brand Dekko and the slogan "broken house - pipes are not damaged" has been used by domestic and foreign customers. Phuc Ha Plastic Factory will contribute to creating stable jobs for local laborers, contributing to the economic development of the province as well as the economic growth of Hung Yen. With the launch and operation of the new factory, Phuc Ha will continue to meet the requirements of the pipeline needs of good quality, durable and ensure food safety and hygiene with competitive prices. . Since then, Phuc Ha Company strives to become one of the leading plastic pipe and fittings manufacturers in Vietnam. Sản phẩm ống nhựa DEKKO vinh dự nhận Danh Hiệu Hàng Việt Nam chất lượng cao 2018.